The year 2012 opened with mounting civil society concern about the violent suppression of community protests over land and resources. January protests in Jakarta pointed to three prominent cases – Mesuji, Bima and Pekasa - which showed how armed security forces were being used to deal with community opposition to landgrabbing. In Mesuji, Lampung province, southern Sumatra, protests over land involving two palm oil companies PT Sumber Wangi Alam and PT Barat Selatan Makmur Investindo, and a state-owned timber plantation company, Silva Inhutani, had ended in four deaths within a one year period. The death toll over the 2009-2011 period was 30 people. In Bima, West Nusa Tenggara province three people were shot dead and another 9 were critically injured in late December 2011 when police and military personnel fired on a peaceful protest against the takeover of their farmland by an Australian-owned mining company PT Sumber Mineral Nusantara. The same month, in Sumbawa, also in West Nusa Tenggara province, around 50 houses inhabited by indigenous Pekasa families were reported to have been burned down by police and military personnel in a move to evict them from an area claimed by the state as a protected forest and targeted by gold mining company Newmont Nusa Tengara for exploration. The government body responsible for dealing with land conflicts, the National Land Agency (Badan Pertanahan Nasional, BPN), reported as many as 2,791 land disputes in 2011, while the National Human Rights Commission said that 738 land disputes had generated 4,502 formal complaints of rights abuses. Meanwhile civil society organisations’ records give more detailed snapshots of the extent and types of land conflicts in Indonesia today. KPA, one of Indonesia’s leading CSOs working on agrarian issues, noted 163 agrarian conflicts across the archipelago during 2011, a large increase from 2010 when they had documented 106 conflicts. Twenty two people had been killed in the conflicts, which had involved around 70,000 households and covered almost half a million hectares. Most of these cases (60%) had occurred in plantations, while 22% had been in forests, 21% were conflicts over infrastructure projects, 4% (8 cases) in the mining sector and one case in coastal areas. East Java saw the highest concentration of cases during the year (36 cases), with North Sumatra (25 cases), Southeast Sulawesi (15 cases) and Central Java (12) having the second, third and fourth highest number of conflicts. The Sumatran provinces of Jambi (11), Riau (1) and South Sumatra (9) were next highest, with other areas following behind. Meanwhile, another leading resource rights CSO, HuMa, noted 110 cases, covering 2.7 million hectares of disputed land. These conflicts involved government and companies as dominant players. The conflicts in 2011 and more violent incidents in 2012 have sparked renewed demands for the deep, pro-poor agrarian reforms that many civil society organisations have been calling for since former president Suharto’s fall from power in 1998 ushered in the period of reformasi. Laws governing the use of the country’s land and natural resources, they argue, have not been implemented to ensure that Indonesia’s natural wealth is being utilised for the benefit of the majority of its people. Instead, these laws – particularly the sectoral laws passed under the Suharto regime and subsequently – have provided the legal foundation for the unsustainable exploitation of the country’s minerals, oil and gas, forests and seas by a handful of business conglomerates for the benefit of the business-political-military elite. Indigenous peoples have been particularly disempowered by the failure of successive governments in Indonesia to implement any provision for recognising and protecting their customary territories and resources. This is the case from the 1960 Basic Agrarian Law (UUPA) onward. An early Suharto-era Forestry Law of 1967 led to around 70% of Indonesia’s territory being categorised as the ‘state forest zone’ and, as the majority of Indonesia’s forest-dwelling indigenous peoples lived in this zone, their ancestral rights to the lands and resources were effectively swept aside to allow in the timber, mining and (later on) plantations barons. Indigenous lands within this state-claimed forest zone were also appropriated for the resettlement of poor Javanese families under the World Bank-funded transmigration scheme. In addition, they were also allocated for national parks and other categories of protected forest, without indigenous peoples’ consent. In the years immediately after Suharto’s ousting from power in 1998, campaigners pushed hard to refocus policy-making on the interests of the poor, supported by mass movements of peasant farmers to reclaim and reoccupy land taken away from them over the previous three decades. There were also renewed efforts to reclaim indigenous peoples’ rights and territories. A new forestry law was passed in 1999, but this only provided for limited rights for indigenous peoples to use lands within state-controlled forests. Following his visit to the first Congress of Indigenous Peoples of the Archipelago (KMAN) in 1999, the agrarian affairs minister issued a decree (Permen Agraria No 5/1999) which paved the way for improved recognition of adat rights, but this was not implemented. In 2001, came a major breakthrough when Indonesia’s highest legislative body, the MPR, issued a decree (TAP MPR IX, 2001) to prepare the ground for the reform of all sectoral laws affecting land and natural resources management. However, over a decade later, this decree has still not resulted in the intended reforms and an original intention to replace or reform the 1960 UUPA has been dropped. Calls from civil society for a special commission for land conflict resolution to be established were rejected and instead the BPN was given the task of dealing with land conflicts – despite the fact that the BPN itself causes conflict by handing out land licences. This was also a set-back for greater accountability and transparency because the BPN was well known for corrupt practices during the Suharto era and well into the post-Suharto period, and remained a source of funding for highly-expensive election campaigns. Government commitments to implement land reform have come and gone, including commitments by current President Susilo Bambang Yudhoyono, who promised land reform as part of his election campaign in 2004. While important progress towards gaining recognition for indigenous peoples’ rights to their lands and resources has been made, the vast majority of new sectoral laws that have been issued continue to confirm the land rights status quo. As a result, the promotion of business interests over community needs remains as prominent as ever. This has meant that more and more of Indonesia’s land has come under the control of powerful businesses. According to a summary by KPA published in September 2012, 531 logging and timber plantation licences have been issued, covering 35.8 million hectares of forests controlled by a handful of local and foreign companies. Around 11.5 million hectares is covered by oil palm plantations; more than twenty islands have been acquired by foreign investors for the tourism industry. According to JATAM, 35% of the country’s land area is covered by mining concessions. This area is set to expand much further: Sawit Watch says the government has issued a total 26.7 million hectares of ijin lokasi (location licences) for oil palm development, thus tripling the area currently under cultivation. Up to 3.5 million hectares is reported to be allocated for new food estates and 9 million hectares for new timber plantations by 2016; an additional 2.2 million hectares of the state forest zone will be used to expand non-oil and gas mining; and 1.5 million hectares has been planned for jatropha plantations. A further 26.6 million hectares of forests is to be dedicated to REDD+ projects to mitigate climate change. The development of these businesses has had a clear impact on agrarian structures, as John McCarthy et al writing in the Journal of Peasant Studies this year note. “Between 1983 and 2003 the Gini coefficient for land distribution in outer island Indonesia increased from 0.48 to 0.58 indicating rapidly growing inequality in land ownership. In South Sumatra and South Kalimantan, the percentages of households in the category of marginal farmers with landholdings considered too small to meet more than subsistence requirements, have increased from 9% to 20% and from 30% to 40% in each province respectively over 20 years.” According to Chalid Muhammad, director of Indonesia’s Green Institute, agrarian injustice has remained entrenched since the Suharto period and has not been addressed by successive post-Suharto governments. The result is that more than 50% of Indonesia’s land is controlled by less than 500 businesses, including national and international companies. The regional autonomy laws passed in 1999 which aimed at decentralising control over the management of land and resources, have only been partially implemented and have largely not – as many hoped – resulted in a fairer use of natural resources and greater accountability to local populations. A central pillar of Suharto’s New Order regime was the use of Indonesia’s rich agrarian and natural resources to enrich the president’s family members and friends and to consolidate his power. As noted in Marcus Colchester’s book review in the previous edition of DTE, instead of promoting more social justice, “the process of decentralisation has...facilitated the proliferation of the same predatory elites, once dominant in Jakarta, to populate every corner of the country.” Land and resources are a key means of accumulating power, and paying for election campaign “war chests”. It is common knowledge that more and more licences for the commercial exploitation of the country’s land and resources will be issued to generate funds to support the candidates’ campaigns in the next general elections in 2014. It is ironic that given the alarmingly high level of land conflicts, promises to address land problems will no doubt become a focus for some of these election campaigns. McCarthy et al have further underlined why pro-big business policies are prioritised by the regional governments whose officials hold key powers within networks involving local businessmen, brokers, investors, local companies, local populations and large corporations. Referring in particular to the expansion of oil palm plantations, they note: “[f]or district governments a failure to attract investors would be perceived as an inability to deliver the maximum development benefits. On the other hand local governments who attract investors and issue large numbers of permits gain directly – from entitlements in oil palm schemes and through support for electoral programs in return for services rendered.“ Moreover, the unclear, complex procedures for acquiring land and overlapping land use regimes provide officials with opportunities for rent-seeking. As a separate article on Aceh in this edition of the DTE newsletter shows, the ‘special autonomy’ introduced for this region has not been implemented in ways that result in gains for less powerful communities and the process of handing community land over for large-scale commercial projects has continued. Regional level laws relating to land have been passed in both Aceh and Papua, which recognise indigenous land and resource rights. In Papua (and in the now separate province of Papua Barat) they have not been implemented as the implementing regulations required to activate them do not yet exist. In Aceh, key provisions in the two qanun (regional regulations) that are most important for indigenous peoples (numbers 9 and 10 of 2008), have not been implemented. Moreover, a draft law on the role of Mukim - traditional inter-village institutions for decision-making on lands and resources lying outside the agricultural boundaries of the villages - had not yet been passed in mid-2011 after a five year delay. Land reform efforts supported by the World Bank and Asian Development Bank among others have focused on getting land registered – a task given to the National Land Agency (BPN), set up in 1988. However the pace of registration has been slow and expensive. It has also drawn criticism from CSOs who argue that registration will intensify the treatment of land as a commodity, will lead to greater inequality in land distribution as more land is traded with dominant landowners more likely to consolidate gains. Meanwhile, the continued failure to accommodate communal land title means that indigenous communities continue to be disadvantaged by the process. Around 70% of national territory is claimed by the Indonesian government as ‘forest’ under control of the state. Less than 0.2% of this has been allocated to communities under various tenures available in law. Most of the area has been awarded to the forestry industry and to be converted to other uses such as plantations, under processes whose legal basis have been challenged. The customary territories of the estimated 60-100 million indigenous people in Indonesia, overlaps with the land inside and outside the state-controlled forest zone, and their rights to use these lands have only weak recognition under the law (as hak ulayat). These usufructary rights are subordinated to other land use rights, such as forestry, plantation and mining concessions as handed out by the government. The remaining 30% of Indonesia’s territory falls under the official land titling regime of the Basic Agrarian Law of 1960 (UUPA) and its implementing regulations, with registration being administered by the National Land Agency (BPN). In recent months there has been a greater level of public debate on land, as several important draft laws related to agrarian issues are scheduled for debate in Indonesia’s parliament. At the same time, Indonesia’s indigenous peoples’ alliance AMAN is moving to consolidate the political space they have prized open in the past few years. On the positive side, TAP MPR IX/2001 has been brought back onto the table in government discussions about land and land reform. Last year in his keynote speech in an international conference in Lombok, Kuntoro Mangkusubroto referred to the TAP MPR as the clear legal basis for reforms on land tenure. Kuntoro leads the Presidential Unit for Development Monitoring and Oversight (UKP4) and the REDD Task Force. Along with the constitution and the 1960 UUPA, it is also one of the three reference laws in the new draft land law (see below). Indigenous peoples are also making moves to formalise their claims over land. A new draft law, prepared by the indigenous peoples’ alliance AMAN, to recognise and protect indigenous peoples’ rights is currently under discussion in parliament. It remains to be seen, of course, how far it can withstand efforts to water it down by the powerful vested interests lined up against recognising indigenous rights to control their territories. In November 2012, the results of an initiative to map indigenous territories across Indonesia by the Ancestral Domain Registration Agency (BRWA) were handed to UKP4/REDD+ Task Force and the Geospatial Information Agency at a Jakarta press conference. The land on the BRWA maps – 2.4 million hectares consisting of 265 maps of indigenous territories - represents only a small fraction of actual indigenous lands, but it could nevertheless mark an important step on the road to full recognition by the Indonesian government. At the Jakarta press conference Kuntoro said the BRWA information would be included in the One Map – an initiative to bring all land use maps together which is linked to the two-year moratorium on clearing primary forests and peatland, announced in May 2011. (See also interview). Having all land use information on one map may seem like an obvious basis for coherent national planning. However it has never happened in Indonesia until now, partly due to an apparent reluctance on the part of some of the powerful sectoral ministries preferring to keep control of their own land use information. Civil society organisations have commented that the One Map policy, has both risks and opportunities. On the one hand, if local community land is clearly marked on the map, incoming investors will have a quick reference to find out which communities need to be targeted to persuade them to give up their land; on the other hand, if maps are publicly available and accessible to communities, they will be able to see which of their lands has been allocated to what kind of development and ensure they are well prepared to resist any transfer of land before it happens, rather than after it has already been agreed over their heads by government officials. The maps are also designed to allow both government and civil society organisations to identify who is responsible for illegal land clearance. Other national policies threaten to overwhelm any gains: the push for economic development detailed in the government’s Masterplan for the Acceleration and Expansion of Indonesia Economic Development (MP3EI) represents a potentially hugely damaging regressive step for indigenous peoples and local communities. Launched last year by the Coordinating Ministry for Economic Affairs, MP3EI is promoting large-scale private and public sector projects with scant regard for human rights, environment or climate impacts. MP3EI involves developing large energy, infrastructure, industrial, and agribusiness projects across Indonesia in six target ‘corridors’, prioritising 22 economic activities. Focused as it is on large-scale top-down resource exploitation projects, and relying on huge amounts of investment capital from private as well as public sectors, MP3EI represents a return to development Suharto-style: highly centralised decision-making on large-scale projects imposed on Indonesia’s regions without consultation or consent. MP3EI’s smelters, petrochemical plants, nickel and coal mines, industrial plantations, ports and roads seem likely to encourage landgrabbing at its worst. It is telling that the MP3EI does not make any estimates of the land needed for the various large projects listed as priorities in the six ‘corridors’. Indeed if someone read the plan with no prior knowledge of Indonesia’s complex land situation they may well get the impression that there are no significant obstacles to such developments. Only now and then are land issues mentioned, such as under the “difficulties in land acquisition” as one of the challenges to coal mining development in Sumatra; “the overlapping of land use for mining and for forestry or plantations in Kalimantan” identified as a challenge for coal development in Kalimantan; and “land use overlaps” as an obstacle to nickel mining in Sulawesi. Linked to MP3EI is the 2012 law on land acquisition for development. Its passage through parliament was met with intensive criticism from CSOs who argued that it legitimised landgrabbing, would lead to increased poverty, landlessness and conflicts. A judicial review has been launched against the regulation by an Indonesian NGO coalition against landgrabbing, including Friends of the Earth Indonesia (WALHI), KPA and Sawit Watch. DTE recently pointed out to UK parliamentarians that some of Indonesia’s biggest landgrabbers enjoy financial backing from UK investors. They include Jardine Matheson, majority-owner of Indonesian conglomerate Astra International, which is involved in plantations, mining and the automobile industry. Other investors are coal mining giants BHP Billiton, Bumi plc, Archipelago Resources, a UK company involved in conflict with communities over its gold mining operations in North Sulawesi, and Rio Tinto – involved in the Freeport copper and gold mine in Papua. In forest areas, women may also be vulnerable to gender injustice, according to Indonesian researchers Mia Siscawati and Avi Mahaningtyas. Three case studies – indigenous women in Banten and Central Kalimantan and a rural woman in Gunung Kidul, Yogyakarta province - demonstrate how women face various forms of gender injustice such as subordination, marginalisation, discrimination and stereotyping which limit their access to and control over their lands. The researchers argue that “the reformulation of the legal framework for forest lands and resources, which should include the recognition of the rights of Indigenous Peoples, should also include gender justice principles and actions.” They are also calling for systematic capacity building on gender justice in forest tenure and governance among government institutions, civil society organisation and donor agencies; increasing the voices of women and vulnerable groups in decision-making; and adopting gender justice principles in community organising processes and in multistakeholder approaches in reforming forest governance through tenure conflict resolution. A new draft land law (RUU Pertanahan) has drawn criticism from the Consortium for Agrarian Reform (KPA) which was invited to comment by the working group preparing the law. KPA said the draft law reflected the struggle between three main groups: the pro-land market group, including World Bank and ADB who were in favour of getting rid of the 1960 law, those in favour of properly implementing the 1960 law in its original intention and those in favour of keeping the 1960 law with amendments. Iwan Nurdin of KPA said the draft law appeared to be aimed at promoting the registration of land and was not based on the spirit of agrarian reform. The ADB has been involved in promoting the new law not least as a means of addressing concerns about bottlenecks in implementing infrastructure projects. In 2007, the ADB provided technical assistance worth US$500,000 (with a later additions of $300,000) to help draft the new law. Originally designed to finish in January 2010, the revised closing date for the funding (and therefore passing of the law and follow-up work included in the project) is now June 2013. ‘Kasus Mesuji, Pemerintah Belum Sentuh Akar Konflik’, KPA website, http://www.kpa.or.id/?p=672 [no date] accessed 23/Nov/12. Mesuji, Cermin Konflik Agraria yang Kronis, KPA website http://www.kpa.or.id/?p=636, accessed 23/Nov/12. Joint press release 24/Dec/11, Walhi. The Australian company is named as PT. Arc Exploration Ltd.
 BeritaHUKUM.com, 24/Dec/11, http://www.beritahukum.com/detail_berita.php?judul=Polisi+Akui+Pembakaran+Puluhan+Rumah+Adat+Pekasa#.UK9vyGeXlCo, accessed 23/Nov/12. Joint Press Release, Catatan Akhir Tahun 2011, AMAN, HuMa, WALHI, KPA and others 29/Dec/11. Joint Press Release, Catatan Akhir Tahun 2011, as above. See Tim Lindsey ed, Indonesia Law and Society, The Federation Press, 2008; Obstacles and Opportunities, WALHI and AMAN, 2003, and Forests, People and Rights, DTE special report on Forests, 2002, for more background. See Indonesia’s Transmigration Programme: an Update (DTE, 2001). For more background to the UUPA, see DTE 76-77, May 2008; DTE 72, May 2007; DTE 66, Aug 2005 (re Perpres 36/2005 on land acquisition for dev); DTE 62, Aug 2004 on new plantation law and call for agrarian conflict resolution commission; and DTE 60, Feb 2004 on land poverty. See Forests for the Future, AMAN-DTE, April 2009, pages 280-281, Obstacles and Opportunities, WALHI and AMAN, 2003 and Forests, People and Rights, DTE special report on Forests, 2002, for more background and analysis on this regulation. For more background on the TAP MPR 2011 see DTE 52, February 2002. See Jude Wallace, ‘Indonesian land law and land administration’, in Tim Lindsey ed, Indonesia Law and Society, The Federation Press, 2008. See DTE 72, March 2007. These include amendments to the Constitution (18B(2) and 28I(3)) which recognise “customary law peoples” and their traditional rights, and respects their cultural identity; and other laws and regulations including Human Rights Law (39/1999); Law 32/2004 and regulation 72/2005 which frees indigenous peoples being organised in standardised “desa” or villages; Law No.27/2007 on coastal areas and small islands which recognises customary wisdom, indigenous laws and rights, Law No 32/2009 on environmental protection. For a comprehensive list see ‘Peluang Hukum untuk Pengakuan Hak Masyarakat Adat atas Wilayah Adat (tanah ulayat), presentation by Sandra Moniaga, Samdhana Institute 25/May/12. Sectoral laws seen which are seen as particularly skewed towards large-scale businesses and investors include the forestry law 41/1999, plantations law 18/2004, water law No 7/2004, minerals and coal 4/2009, investment 25/2007, horticulture 13/2010, Oil and Gas 22/2001 and Land Acquisition for development in the public interest 2/2012. Palm oil and indigenous peoples in Southeast Asia, January 2011, FPP, Cirad, ILC. See book review DTE 91-92. 'Trajectories of land acquisition', as above. World Agroforestry Centre quoted in Palm Oil and indigenous peoples in South East Asia, FPP, cirad, International Land coalition, Marcus Colchester, January 2011. Researchers have established that most concessions have been handed without the proper legal processes being followed and that the government has legally established state forest in less than 10% of the overall forest estate. (See AMAN-DTE, Forests for the Future, April 2009, p.279). 31] BRWA, (http://brwa.or.id/) was set up by AMAN and JKPP See also DTE 87. See DTE 89-90 for background on MP3EI. Rebecca Elmhirst, ‘Finding Ecological Justice for Women’, Inside Indonesia Jul-Sep 2012. ‘Gender Justice: Forest Tenure and Forest Governance in Indonesia’, Mia Siscawati and Avi Mahaningtyas, June 2012, Rights and Resources. The draft land law of June 2012 refers to constitution, TAP MPR IX, 2001 and UUPA, has chapters on land administration, land reform, registration, collection and processing of physical data, including measurement and mapping, rights and proof of rights, certification, transferring, conversion, division and extinction of rights, and conflict resolution. 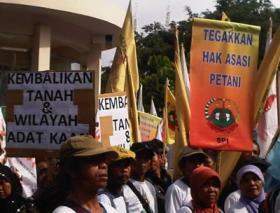 RUU Pertanahan Pertarungan Tiga Kelompok Besar, 27/June/12, KPA website. The project aim, according to the ADB is “to assist the Government to enhance the legal and administrative framework for land law including land acquisition and resettlement. The technical assistance aimed to support, among other things: preparation and approval of a draft Land Law and consultation on the draft Land Law in selected regions and with the civil society; (see ADB Project Data Sheet 37304-012, updated October 2012). A list of what the new law should cover, according to the ADB, includes “redefinition of land-related titles, covering title for apartment, title for space below and above land, land title for adverse possession, customary rights for indigenous communities, riparian rights, and land title for coastal land areas; ..Islamic law and inheritance, and women’s rights over land and related resources and compensation;” and “land acquisition and resettlement for public and private purpose”.